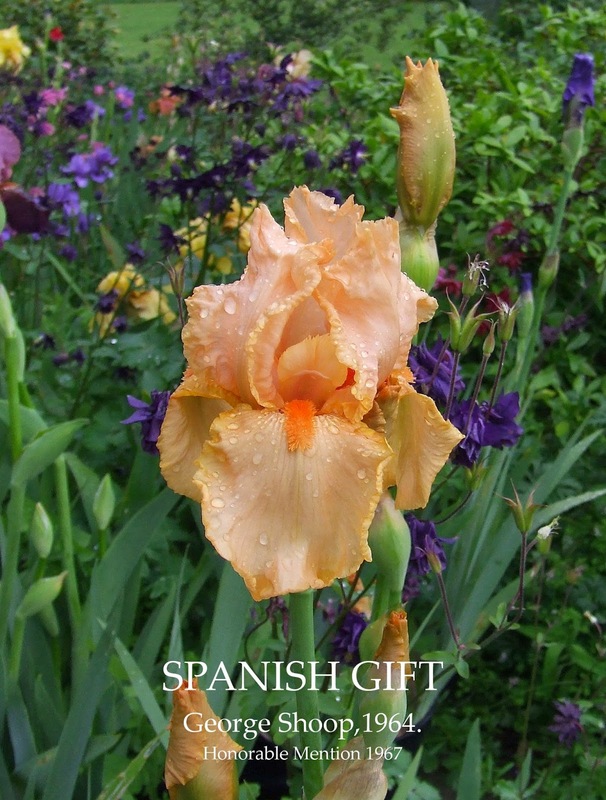 Spanish Gift is in a small and select collection of George Shoop's Irises at home. The bloom has a very chiselled masculine look that displays on strong well branched stems that always have a great bud count. Healthy vigorous growth resulting in a large clump quickly is a huge plus, and even this last bloom season at home which at best could be kindly described as mediocre 'Spanish Gift' was one of the few outstanding performer. Bulletin of the American Iris Society, January 1970, Number 198. The Overlooked Wonders, Joseph J. Ghio, Santa Cruz, California. SPANISH GIFT (Shoop '67) is an apricot-orange of fine branching and bud count. A rhizome will produce an "instant" clump; and in Santa Cruz it is an everblooming iris, a trait to cultivate in more irises! Cooleys Gardens, Silverton, Oregon. Iris Catalog 1970. Warm, glowing, bright orange self; the beard is still deeper orange red on a creamy central ground. Here is a fine follow up on the heels of the variety listed just above from this same hybridizer. Bulletin of the American Iris Society, January 1972, Number 204. Youth-Views. Radical Views Perry Dyer. In the orange class, again the older one appears to be the best all around. SPANISH GIFT (Shoop, '65) is by far the most vigorous orange on the market, and probably has the best form.